“It has a captivating bouquet… It entrances with its pure, wild honey notes mixed with almond and white chocolate scents, bestowed with beguiling delineation and focus. The palate is very poised with the acidity nigh on perfect. 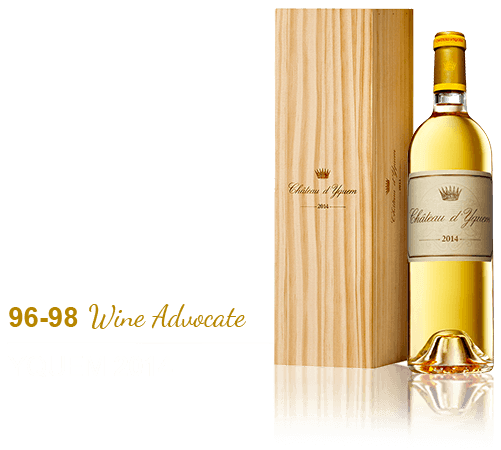 Occasionally an Yquem only reveals its components parts at this early juncture, necessitates conjecture. However the 2014 has a sense of harmony and completeness already, as if the elevage is merely there to usher it on to its finished state. There is undeniably great depth here, perhaps less conspicuous than other vintages because of that silver thread of acidity: notes of lemon sherbet, orange zest, shaved ginger and again, a few ‘flakes’ of white chocolate. It is extremely long with tenderness rather than power on the finish.